Historic Northampton and Forbes Library invite you to a public talk by Joe Manning. This talk is free and open to the public; no registration is necessary. Lewis Hine (1874-1940) was an American sociologist, photographer and social activist. In the early 1900s, after photographing hundreds of immigrants arriving at Ellis Island, he realized he could use his camera as a tool for social reform. In 1908, he was hired by the National Child Labor Committee (NCLC) to aid its effort to end child labor and spent the next decade documenting the working conditions of children. Hine visited western Massachusetts in 1912 and photographed child laborers in Northampton (7 photos), Easthampton (7 photos) and Williamsburg (1 photo). 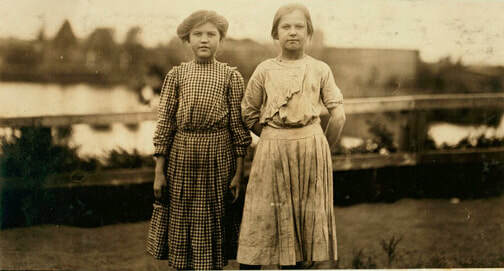 For the past 13 years, author, historian and Florence resident Joe Manning has been tracking down and interviewing the descendants of the child laborers that Lewis Hine photographed. Using the interviews and his own research, Manning tells us how the lives of these children turned out, what they were like, and how they are remembered by their families. His research, called the Lewis Hine Project, appears on his website (MorningsOnMapleStreet.com). His work has been featured on CBS Evening News and National Public Radio. In this presentation, Manning will describe how the project began, show some of Hine’s most iconic photos, talk about how he conducts his research and tell several of his most compelling stories: how the lives of these children turned out and how they are remembered by their families. Joe Manning is an author, historian, poet, songwriter, and retired social worker. He has published two books about the history of North Adams, Massachusetts, and a book of his poetry. A native of Maryland, he has lived in Florence for past 20 years. Photographs by Lewis Hine from the Library of Congress. Title: Two young spinners at the close of a week's work leaving the cotton mill in Easthampton, Mass. They work much longer hours than the burly tinsmith in photo #3033. Location: Easthampton, Massachusetts. August 1912. 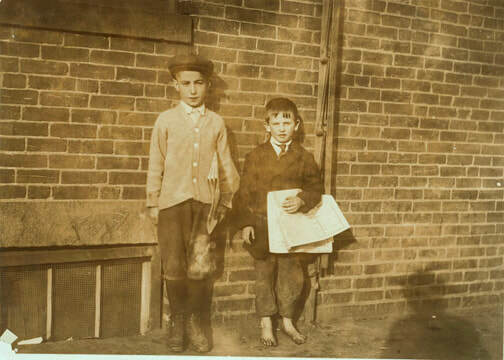 Title: James L. Long, 10 years old, 39 Market Street, Northampton, Mass., and his cousin Johnnie O'Brien, 6 years old who is learning the trade. Location: Northampton, Massachusetts. August 1912. Title: [Addie Card], anaemic little spinner in North Pownal Cotton Mill. See photo No. 1056. Location: Vermont. August 1910.